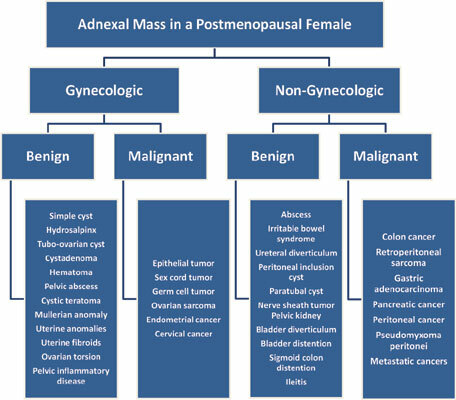 In the postmenopausal women, adnexal masses can have numerous etiologies. They can range from benign to neoplastic, with origins from a variety of organ systems. The diagnostic work up includes a thorough history, physical exam, as well as potential imaging and laboratory testing. There should be a low threshold for consultations with oncologists when there are cancer concerns. Specifically for gynecologic neoplasms, a referral to a gynecologic oncologist should be strongly considered. In this paper, there is particular attention to ovarian cancer given the gravity of delayed diagnosis. Adnexal mass, postmenopausal, ovarian cancer, ROMA, HE4, CA125, OVA.